As you have read along the way, Texas seemed a bit intimidating to us, mostly because of the drive, the distance, to move from one side of the country to the other. But we vowed to embrace Texas and just move through it is as gingerly and appreciatively as we could. We had our eyes set on Austin. Austin, however, was booked. The SXSW Festival was taking place, and so was a rodeo, spring break for most Texans and a sporting event of some sort — oh, and the president was in town. There literally was no room in or around Austin for spontaneous travelers such as we, who needed to work, play and stay as we traversed greater Texas. So we sought residence in the next best location, San Antonio. It turned out to be a new favorite haven. We have embraced our inner Texan. San Antonio was an utterly pleasant surprise. Although it is the seventh most populous state in the U.S. at almost one-and-a-half million people, San Antonio is fun and easy to navigate; it reminded us of a bigger Kalamazoo, Michigan, for those of you who are familiar with it. 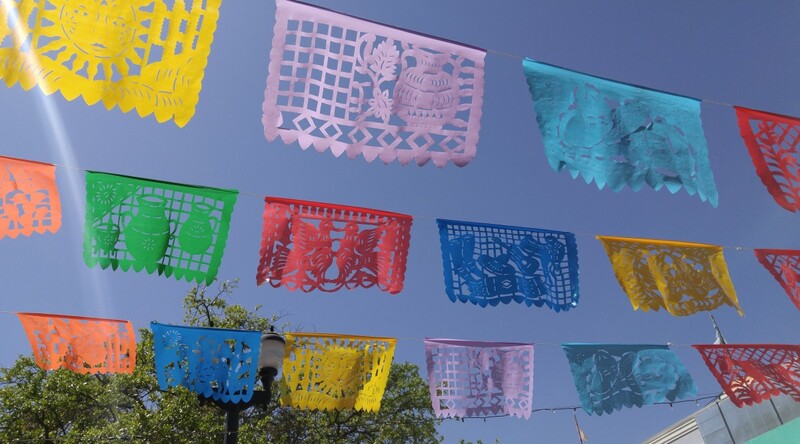 Formerly the capital of Spanish Texas, San Antonio is where old meets new, and where all things Texas/Mexico/America and other cultures intersect. San Antonio is a city for families. San Antonio is beautiful, surrounded by Texas Hill Country. There is so much to see and do in San Antonio that we extended our stay twice, and we hope to return. Here is what we loved about San Antonio. The Various, Beautiful Cultures. One of the most striking things about meandering the streets of San Antonio was the almost constant Spanish-speaking. We felt like we were in Mexico City, yet we were clearly in San Antonio. There was no “American” or “Mexican;” rather, folks here are San Antonians, many going back generations as such. It was a feeling of “all one,” not “them/us.” It is the norm. We were so happy immersed in the diversity and mixed Mother Tongue that we sought it as much as we could. Those lucky bilingual kids. 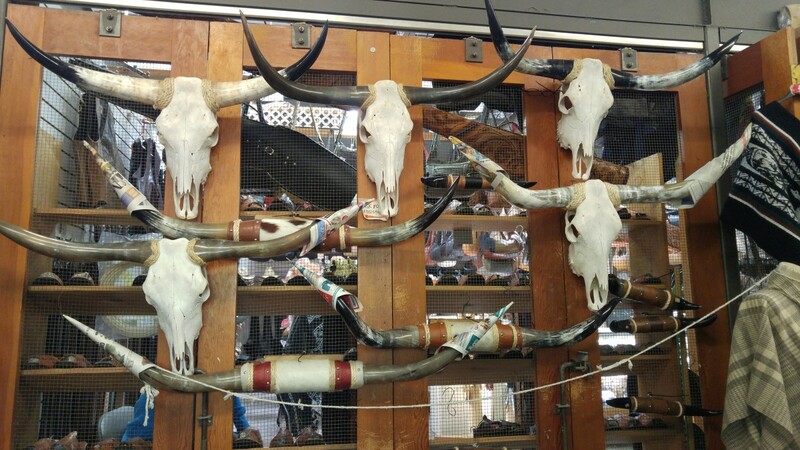 But there were plenty of Stetsons, cowboy boots and trucks, and lots of proud Texans happy to be so. Farmers, ranchers, military, oil and gas, finance, tourism and more — Texans know who they are and they know what they have. Giant metal stars shine from buildings and highway pillars. Forts can be found everywhere, and so can missions. Lots went on in Texas before “Texas was Texas or the States were united.” They seem to be alright with that. It’s another reason why we like San Antonio. Finally, there is German influence in San Antonio. which is the heart of the greater San Antonio–New Braunfels metropolitan area. Germans began immigrating to the Galveston area by 1844 through the efforts of Prince Carl of Solms-Braunfels, Germany, who had plans of creating a secret German feudal state in the region. Impending winter thwarted settlers’ efforts to make it any farther than the area just northeast of San Antonio, which is present-day New Braunfels. (Wikipedia) German influences can be found everywhere, in street and city names in particular. However, our favorite German-influenced Tex-Mex incorporation came in the form of strudels de manzana (apple), which we found at Mi Tierra Bakery and Restaurant — a San Antonio staple — and ate before our travels through West Texas. Delicious. Family Stuff. We consider San Antonio a place for families. 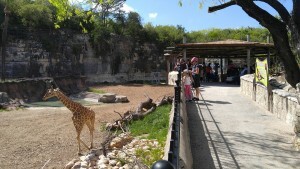 Places to visit include our new favorite San Antonio Zoo, the DoSeeum Children’s Museum and the San Antonio Aquarium. Though not quite our thing, there are other popular venues, such as Sea World and Six Flags. There are plenty of green spaces and parks as well, and they seem to be really popular with locals. 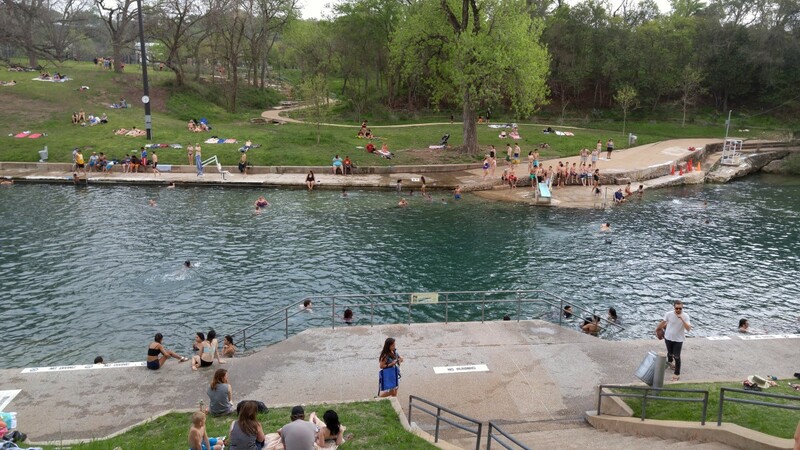 All of these places are easily accessible from downtown or from the east side of San Antonio. We were never more than ten minutes away from something really cool to do for the whole family. 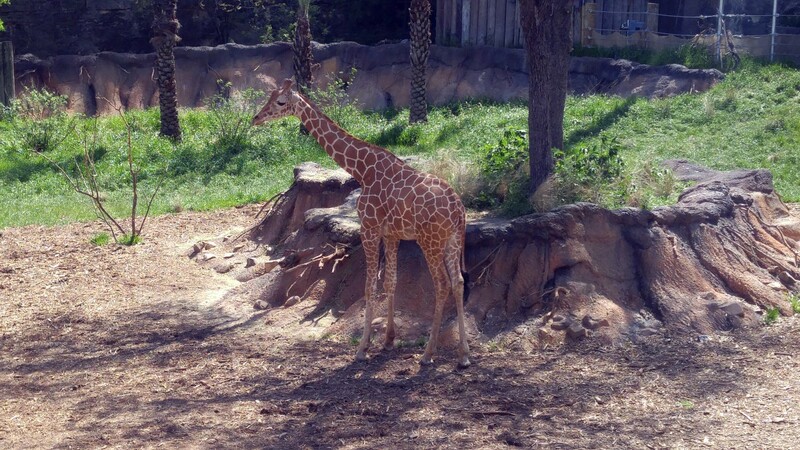 New Giraffe at the San Antonio Zoo. 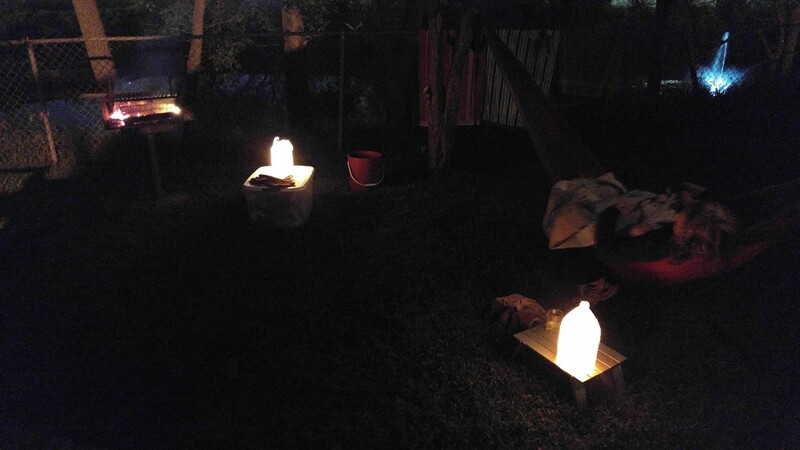 KOA Urban Camping. 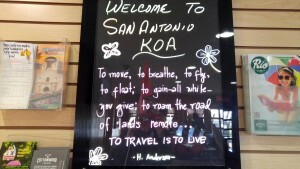 Hanging out in or around downtown San Antonio and a couple of neighborhoods was made possible because of our stellar urban camping experience at the San Antonio/Alamo KOA. 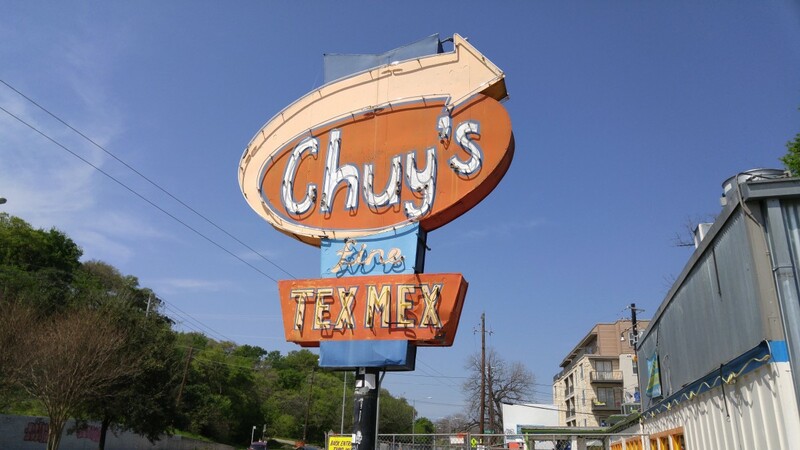 We couldn’t have dreamed of a better location from which we could explore San Antonio. The easy routes were the highways, but we chose to wind our way through downtown and neighborhood streets to experience the city better. There is also an easily accessible bus route to downtown right across the street from the campground should you prefer an inexpensive chauffeur. 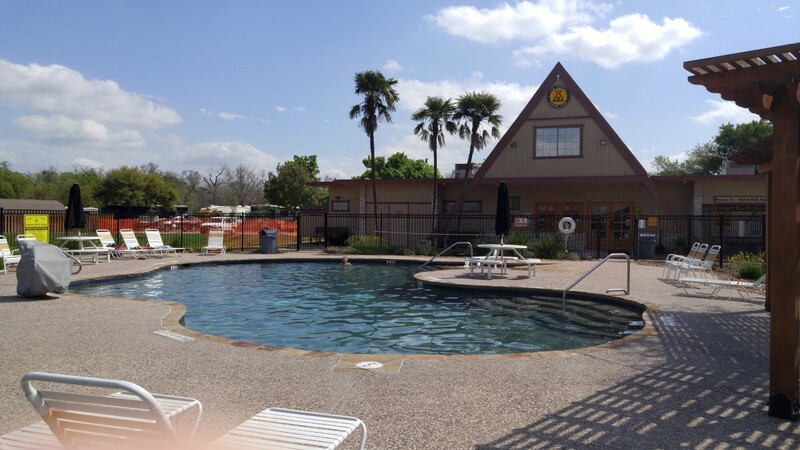 The KOA, already large and well kept in and of itself, is adjacent to a greenway that goes to the city, a golf course and the Salado Creek. Surrounded by nature, our nights were quiet and the stars were bright. We had the best of both worlds camping at this KOA. 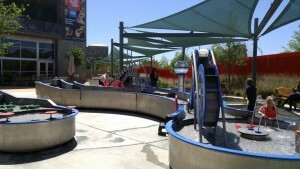 It is a great place for families to visit San Antonio and come back to play and rest. The Food. The food in San Antonio made us super happy. Local West Texas meats and produce blended with Texas and Mexican cultures make for abundant and delicious cuisine, most of which we made ourselves. This had a lot to do with the H.E.B. Texas Grocery. At H.E.B., almost everything is local. Texas herbs, tomatoes, mushrooms and peppers were our favorites. 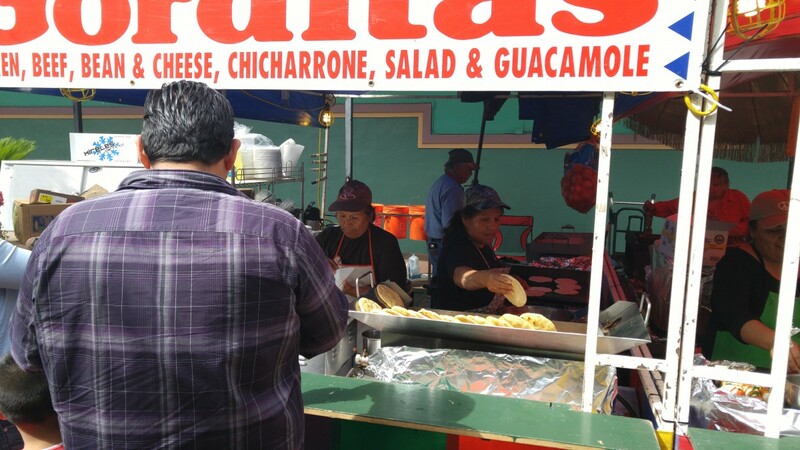 They also provide authentic foods, such as making tortillas on site. Abundant with and proud of all things Texas and beyond, this place is by far our favorite market experience ever. Heading to an H.E.B. is also a great way to meander a neighborhood. For us, this was Alamo Heights. But there are plenty of other amazing food venues if going out is your thing. One way to experience this is to head downtown. Mounds of Chiles at the HEB, San Antonio. Downtown Flavor. 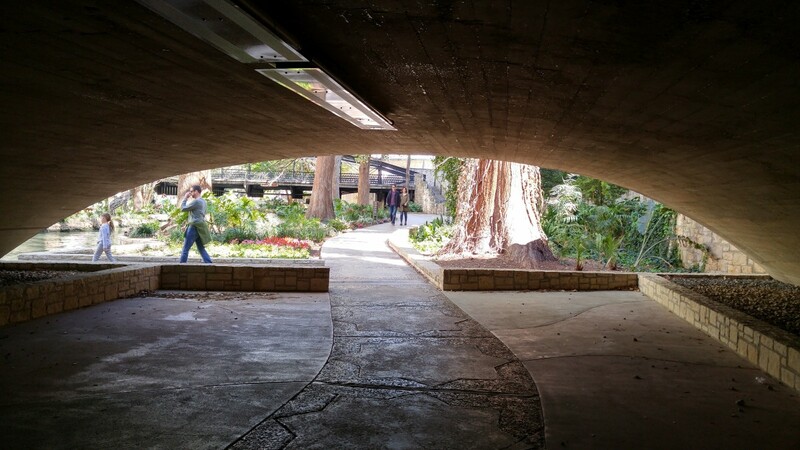 We had heard about the famous River Walk of San Antonio, but we never expected to find what we did — an enchanting subterranean world of water and bustle and calm. 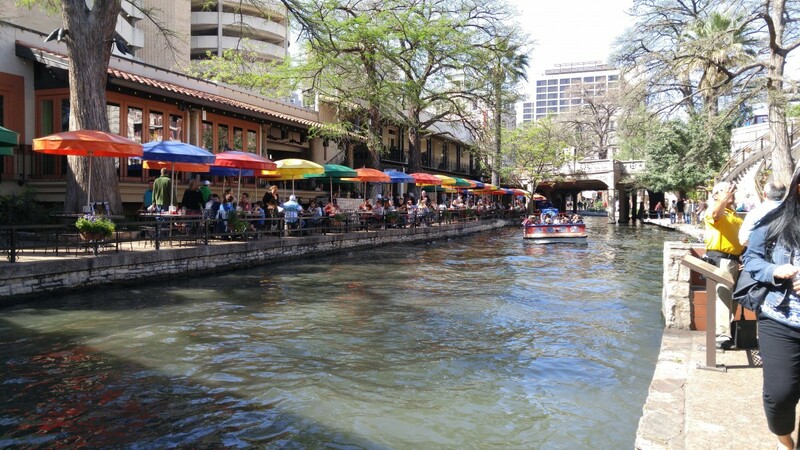 The San Antonio River Walk is an architecturally interesting, culturally diverse mixed bag of restaurants and shops, quiet spaces and theatre, trees, benches, boats and water. One descends from the city above to an entirely different space, with the river and the people and the boats and businesses all moving at different speeds and directions. 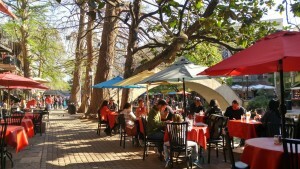 If you want, you can go with a picnic and not spend a dime, just sitting, then perusing and people-watching. Otherwise, there are plenty of places to eat and drink, such as at La Paloma, where we grabbed drinks and snacks after a long walk underground along the river. However, the River Walk might not see as much foot traffic as it does if it weren’t for the Alamo, Texas’ number one tourist destination. 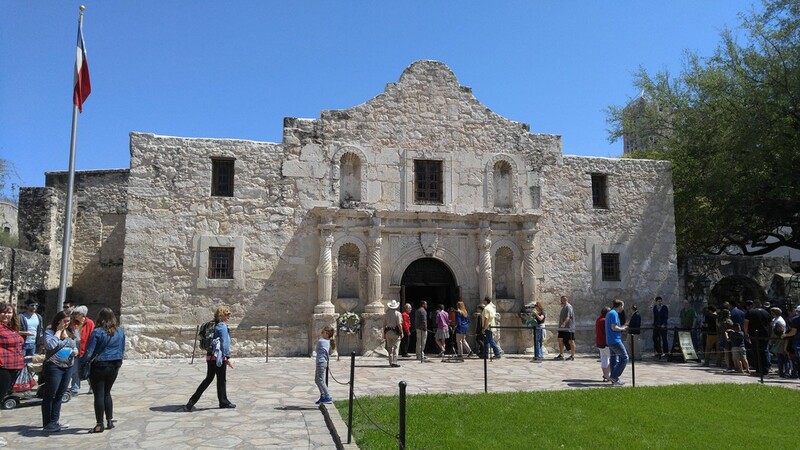 Located on the east side of downtown San Antonio, there the charming Alamo sits, and it is free to visitors. The grounds and structures, including a convent and stone church, are beautiful, and, again, families roam everywhere. Despite being surrounded by a completely urban setting, it is easy to imagine what the area looked like in 1724, when the spot was chosen as its current location. 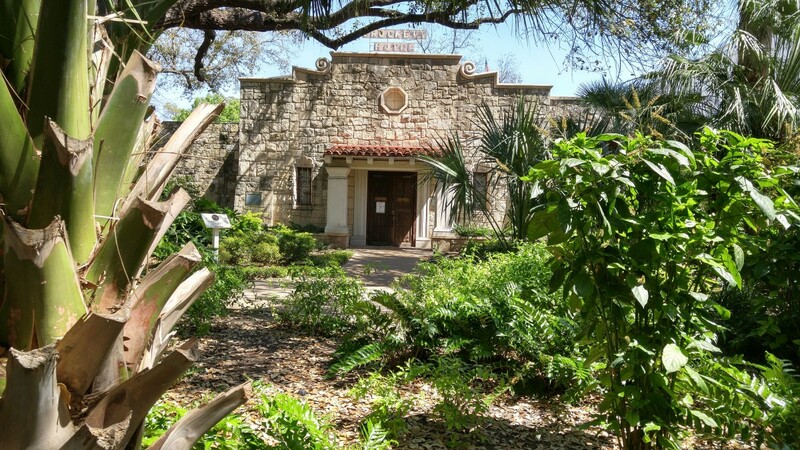 At that time, it was better known as San Antonio de Valero, named after Saint Anthony de Padua and the Spanish viceroy Marqués de Valero, the men who helped Father Antonio de San Buenaventura y Olivares establish the mission. 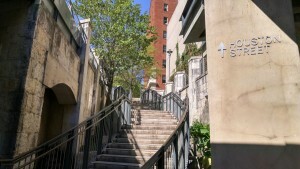 But there is more to downtown than just the River Walk and the Alamo. 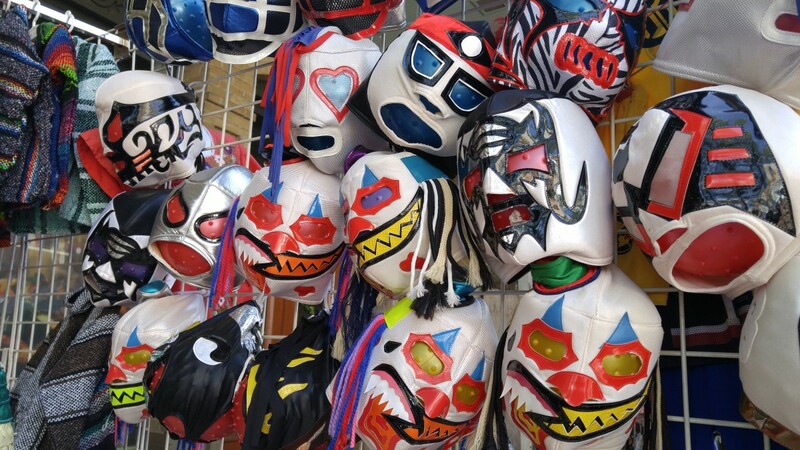 These places include La Villita, San Antonio’s historic arts center, and El Mercado, San Antonio’s historic market square. 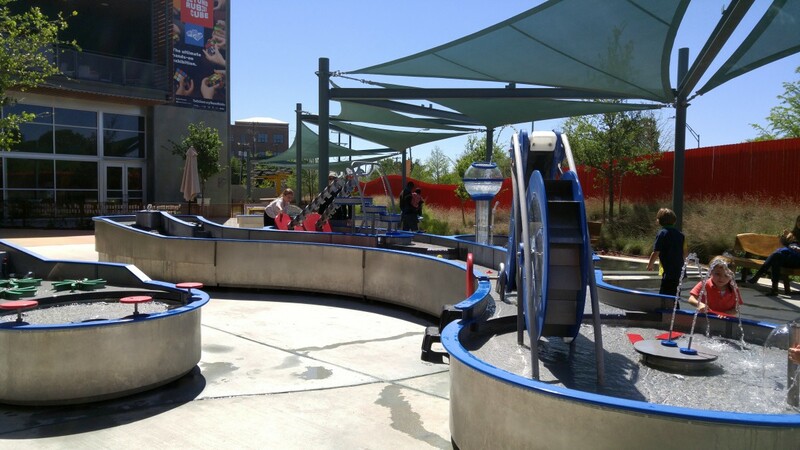 Either venue is great for families who desire a more authentic San Antonio experience. La Villita’s outdoor theatre is situated along a quiet section of the River Walk among tall old trees and enormous modern buildings and sculpture. 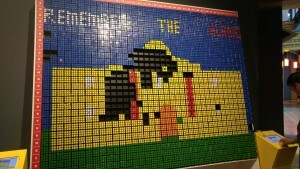 El Mercado is in the heart of downtown and offers various snapshots of Mexican culture in Texas. 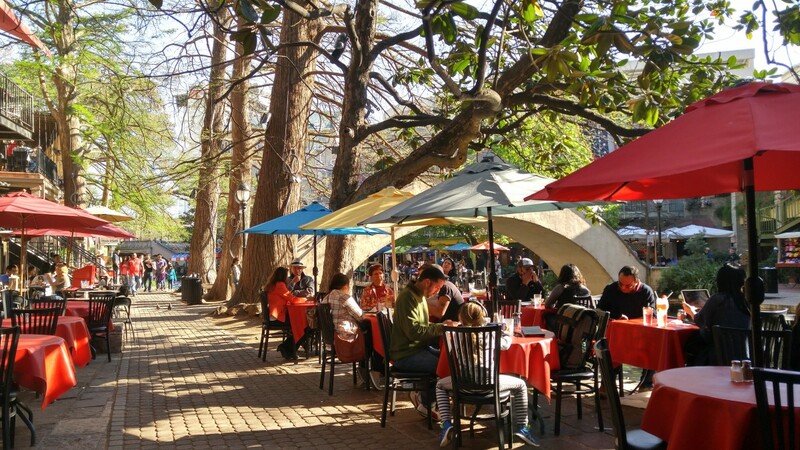 There you will find artisan booths and famous, crowded restaurants, and you will also find delicious street food, like gorditas and churros. Handmade Gorditas and the Ladies Who Make Them. El Mercado, San Antonio. It’s the Heart of So Much More. Finally, San Antonio is about an hour-and-a-half from Austin. Luna and I made a daytrip there to visit a good friend. 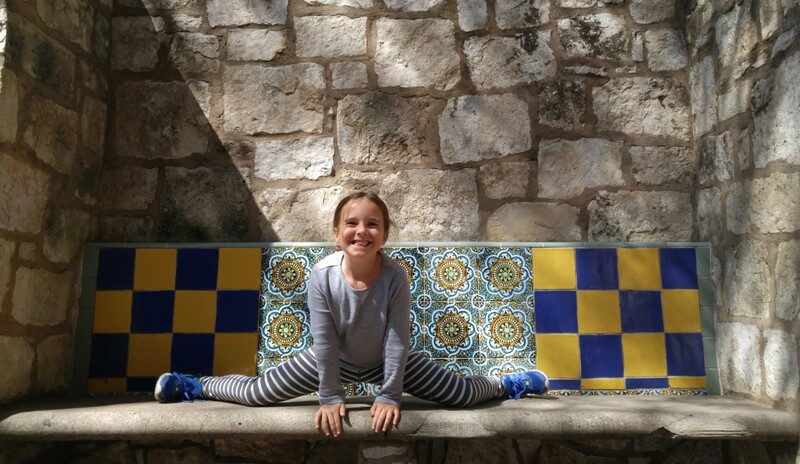 For us, the traffic along I-35 is a bit much with a tired kiddo in tow, but it is still a very doable trip if you are staying in San Antonio. Our next visit to Austin will be in Austin. 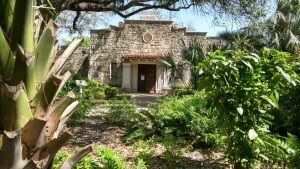 San Antonio also could be a good stopover on your way to Big Bend National Park and West Texas in general. Luna adored the campground, the pool and zoo; they were her favorites. Scot loved the atmosphere, the access to fresh Tex-Mex foods and the lack of mosquitos. For me, I relished in the natural space and cultural immersion. I feel at home among Spanish speakers, especially those that seem so happy. These aspects of San Antonio make it an exceptionally great place for us, and we are thinking about returning next winter. San Antonio is very enjoyable. We are so glad that we were accidental tourists in this southern Texas town. We hope that you take your family for a visit. You will not be disappointed. 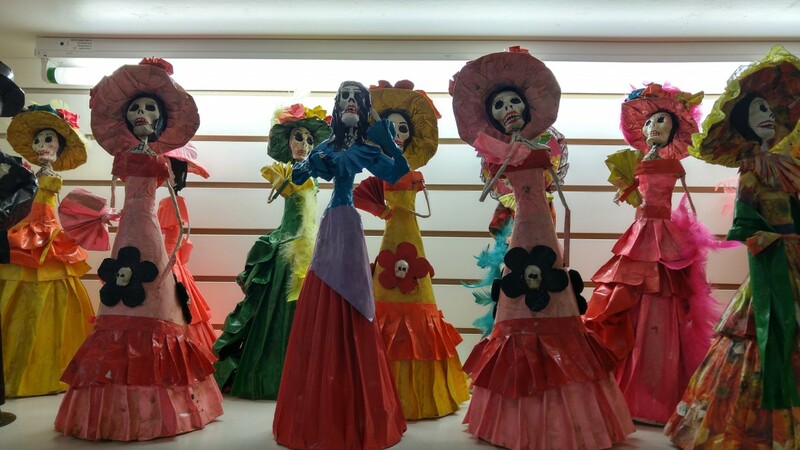 For more information, visit San Antonio, and check out more below from our gallery. Iconic River Walk Scene, San Antonio. 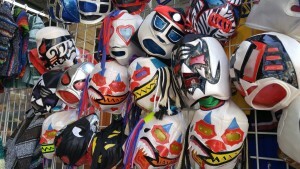 Lucha Masks. El Mercado, San Antonio. 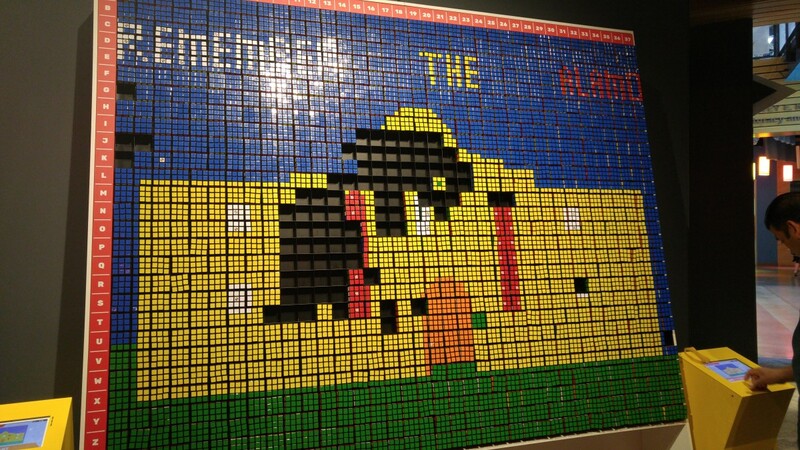 Remember the Alamo, Made from Rubik’s Cubes. San Antonio DoSeeum. 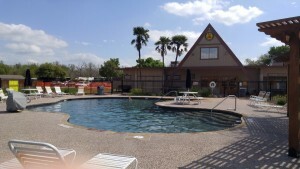 Nighttime at San Antonio KOA. 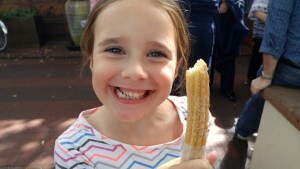 Luna’s Very First Churro, El Mercado. 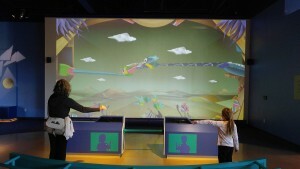 Digital Puppeteering at the San Antonio DoSeeum. 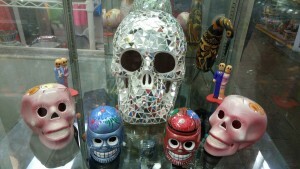 Skull Mosaics. 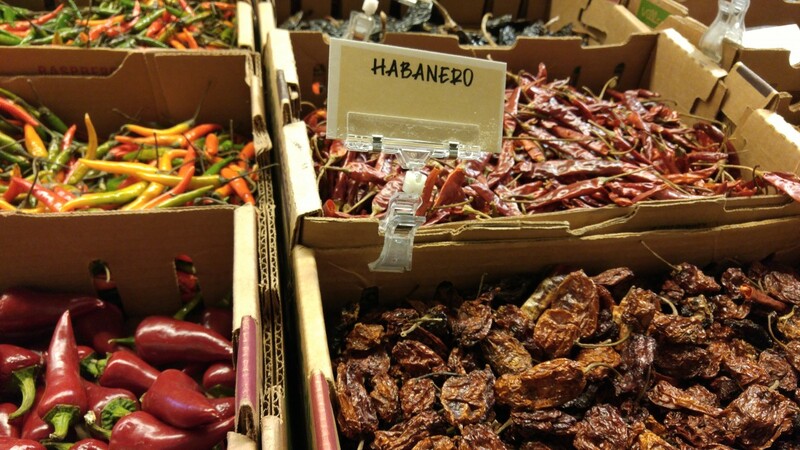 El Mercado, San Antonio. 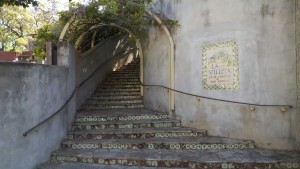 La Villita Theatre. 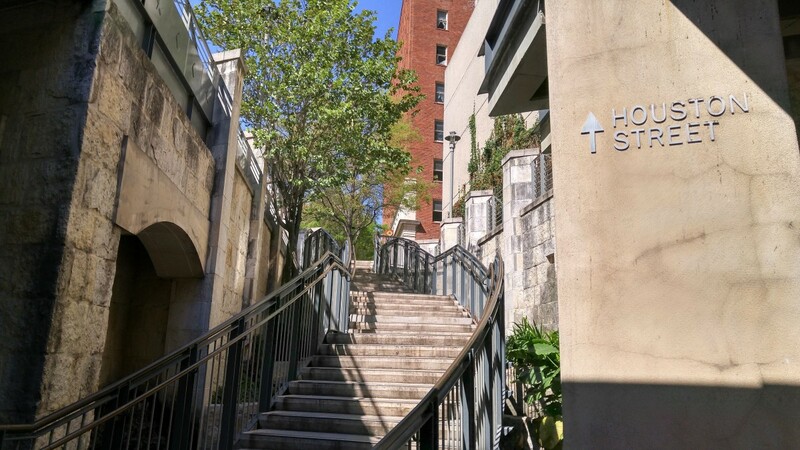 The River Walk, San Antonio. 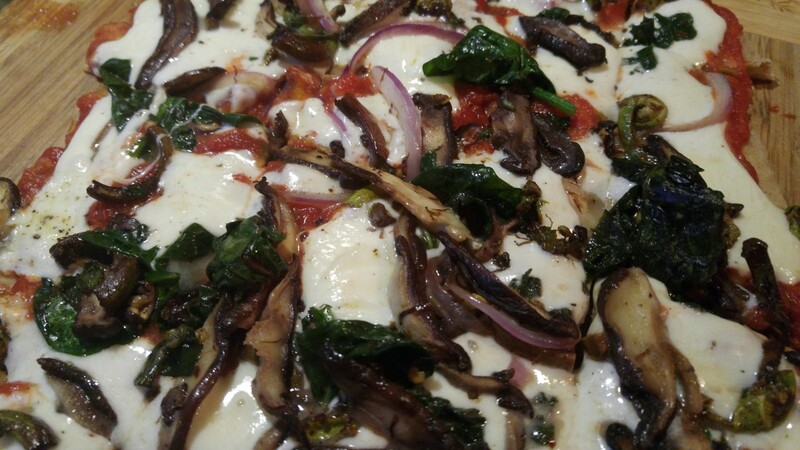 One of Our Campfire Pizzas Made from All Things Texas — Local Mushrooms, Spinach, Cheese, Herbs and Fiddleheads. 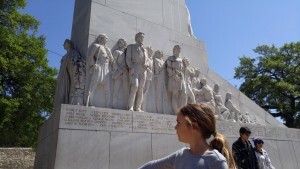 Those Who Fell at the Alamo, San Antonio. When in Austin, Eat at Chuy’s. La Paloma Parilla Grill. 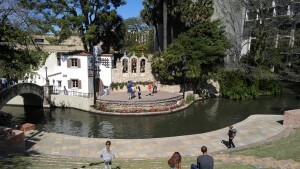 River Walk, San Antonio. Historic La Villita, San Antonio. Famous Barton Springs Pool, Austin. Being from NM, I am always skeptical of anything Texan. Your description of SA make me think a trip through the area is in order. August provides another aspect of the desert southwest worth knowing and experiencing. There is something informative about foot travel (days gone by), commerce, pace of life, and sustenance when the air temperature is 113-degrees….when refrigeration was non-existent, and the only shade, under your feet. Keep the chiggers off your legs, my dear friends! So glad to hear from you. Tumblin’ tumble weeds. I imagine what you say. We like the desert. We liked the desert. It is different. I suppose it appeals to my off-the-grid sensibilities, especially at 113 degrees. I will keep a brimmed hat, though. I have always considered San Antonio a “destination” city having been there twice for profession-related conferences. I was astounded to hear that it is the seventh most populated city in the US! One would never know it by being there. It’s so quaint and intimate. So happy you enjoyed it so much! We feel that way, too. It doesn’t seem so big, yet it is. A giant city. 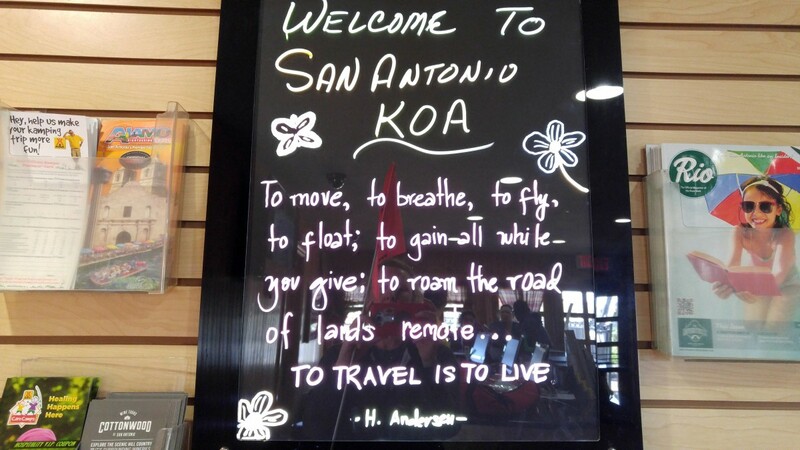 Loved reading your take on San Antonio! We visited a few years ago and fell in love with it. The Riverwalk is so charming, with lots of great food, and we enjoyed the river cruise. 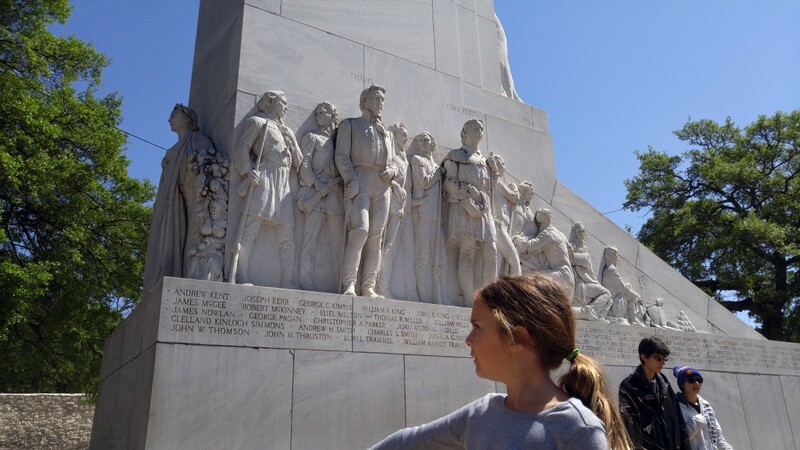 And being history buffs, we loved touring the Alamo. We hope to return one day.